At around 1 p.m. I found the bee belly up in my driveway, when I went to go check if it was dead and poked it with a stick, it was still moving, I got home around 6 pm to find the bee in the same place and position in my driveway completely dead. 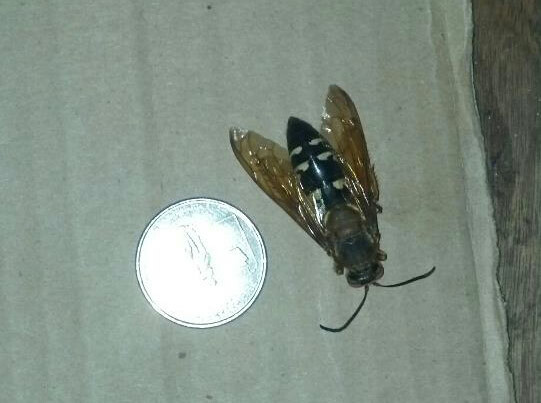 I took a picture and jumped online to try and figure out what it was, we have 2 small children in the home and do not want these monster bees anywhere around. Thanks for sharing your image. Yes this is a cicada killer. It should be noted that this is a wasp and not a bee. Since it was found in your driveway, there is a possibility that it flew into your grill while you were driving and just fell off in your driveway. Either way, if you have these on your property, I can assure you that they are extremely docile. The females are reluctant to sting and the males don't even have stingers. let me know if you discover any on your property.